The sanctuary at Skidaway Island Presbyterian Church is magical this time of the year. I hope you have a chance, when driving by at night, to enjoy our trees as they shine out into the darkness. Remember, as followers of Jesus, we too are to shine the light of hope and love into a dark world. Better yet, I invite you worship with us this season and experience that love. As a child, the best thing about the Christmas tree were the presents sitting underneath. As Christmas approached, more presents were added. Anticipation rose. Each of the wrapped boxes contained a present loving given by a parent, grandparent, or child. They were all different, but what was important were the gifts inside and the thoughts of the person who gave the gift. Big gifts, small gifts, gifts elegantly wrapped, they all help build the anticipation of the season. Seeing these gifts of different sizes reminds me of something that’s important. As there are a multitude of gifts under the tree that are all different, all of us experience and respond to God’s great gift of Jesus Christ differently. In my preaching this Advent and Christmas season, we’re going to explore the different ways we experience and respond to God’s as we look at the Biblical encounters with the Christ-child. It doesn’t matter that they were different. All these ways are valid ways of experiencing God. Each way responds to a different tradition within the Christian family. Mary’s contemplative approach, Joseph’s interest in holiness, John the Baptist’s call to Social Justice, the shepherd’s charismatic experience, Jesus bringing us the incarnation of God, and the Magi’s evangelical approach. All these traditions together help make up a complex church centered on Jesus in the manager. My question to each of you, this season, is how do you experience and respond to God? I hope you join us here at Skidaway Island Presbyterian Church as we embark on this Advent Journey. Today we are going to consider Mary and what we might learn from the contemplative tradition. 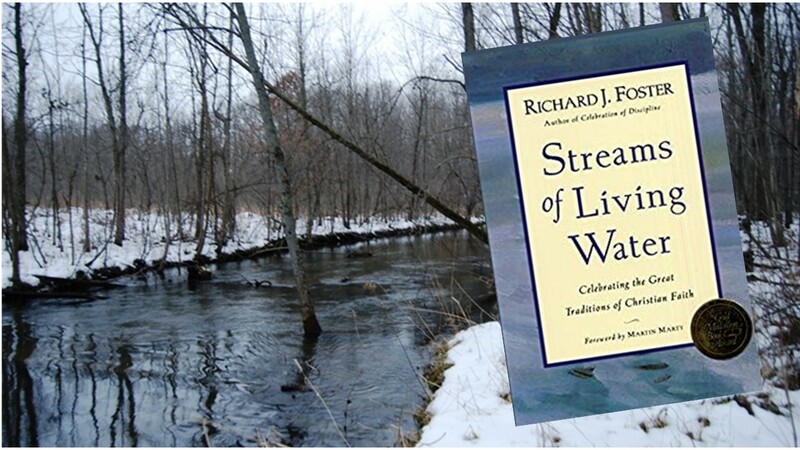 The six traditions of the Christian faith that we will explore this Advent and Christmas season are outlined in Richard Foster’s book, Streams of Living Water, which I recommend. Today’s text will be Mary’s song, sung during her pregnancy with Jesus. Read Luke 1:46-56. This is going to be a different type of sermon series for me. While I will be using traditional Advent and Christmas scripture passages, I will do so through the lens of various traditions found within the larger church. I should state up from that this was not something I came up on totally by myself. This idea of a sermon series based on the traditions of the church as outlined in Richard Foster’s Streams of Living Water came from a friend. Peter Hoytema, a former classmate of mine and a pastor in Ontario, presented this idea the journal, Reformed Worship. One of the reasons I was drawn to this idea of looking at the different traditions of the Christian faith through the lens of those who encountered the Christ Child, is that—too often—we think our experience is the only or the right way. But there’s a problem with this approach. First of all, it’s not even Biblical. If we believe we have the only way to encounter God, we limit God. Jack Haberer, in his book GodViews, makes the point that there are a lot of ways to encounter, worship, and respond to God. Each have Biblical support. When we limit ourselves to just one or two ways, our spirituality is impoverished. It takes all types. Just because someone else experiences God differently, shouldn’t be threatening to us. Instead, embrace it as an opportunity for us to learn about a God who is so much more than us. Too often the church has tried to limit diversity, yet just by looking at our world we should understand that God delights in diversity. When we can accept others, we participate in Jesus’ call to be peacemakers. And this Christmas season, the world needs a little more peace. Don’t you agree? 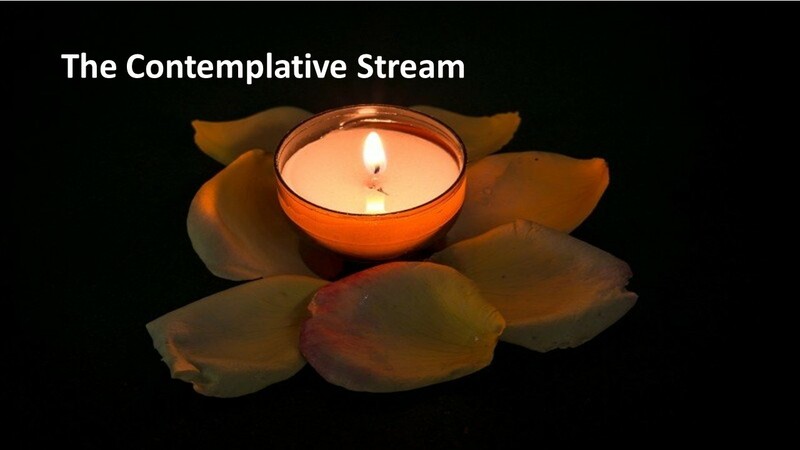 So we begin with the contemplative stream. What is it, you might wonder? It sounds a lot like navel gazing, doesn’t it? And that’s one of the dangers. As the old cliché goes, we can become so heavenly minded that we have no earthly value. But when we over-emphasize one tradition, we risking misusing it. 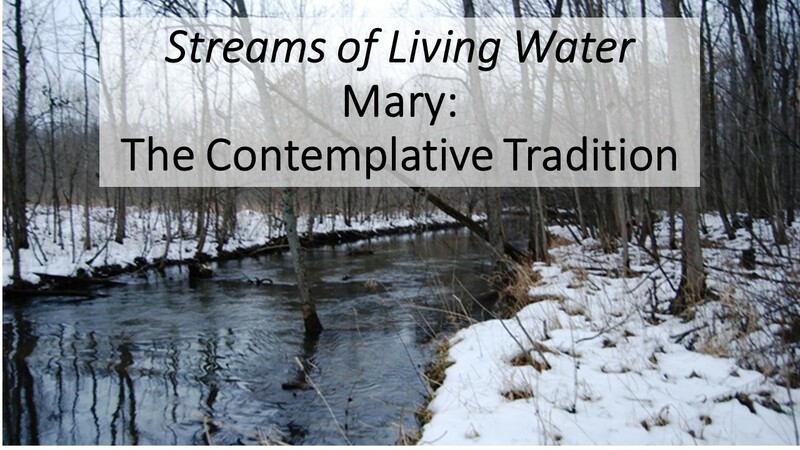 The contemplative stream is grounded in a pray-filled life that, as Foster writes, “is the steady gaze of the soul upon the God who loves us.” The contemplative stream calls us into deep prayer. We don’t just ask God for stuff, but we listen, meditate, and reflect on God’s love, peace, and beauty. It’s a life that empties itself as it seeks to be filled with God-given fire, wisdom, and transformation. And, of course, such blessings are not just for the delight of the contemplative, they are gifts that can be used within the community and which can bring hope into the world. So let’s think about Mary as an example of how a contemplative life can bring us closer to God and help us be a part of God’s work in the world. Mary wasn’t rich or famous or powerful or popular. 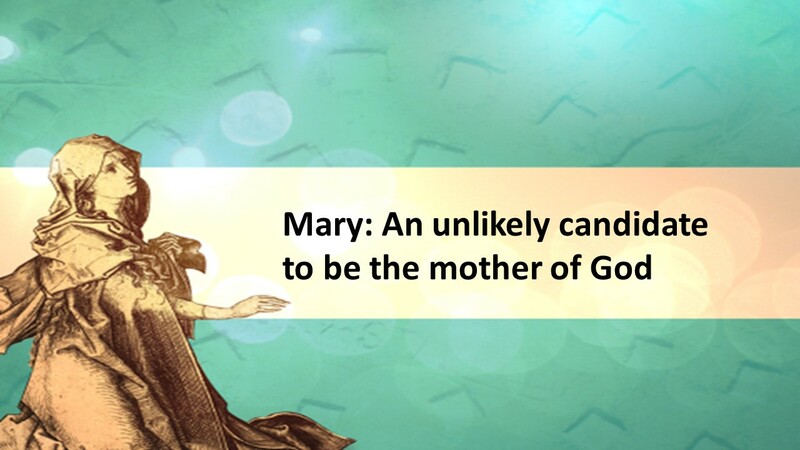 According to worldly standards, she was the most unlikely candidate to be the mother of Jesus, the mother of God. She was young and unmarried, probably poor, from a second rate town in an obscure corner of the world. As far as we know, she had no education and there was no royalty within her blood. Nor did Mary seek fame. Instead, she was absolutely dependent on others. She was dependent upon her father to find her a husband and then would be dependent upon her husband to provide for her and her children. Later in life, she’d be dependent upon her children. She had no control over her life. Mary was just a poor women, like 1000s of other poor women, in a dirt-poor town in an obscure providence of the Roman Empire. She was just like 1000s of other women, except she was chosen to bear the Son of God. It almost sounds like a fairy tale princess story, does it? Yes, it sounds like a fairy tale until we learn that Mary never inherits a castle. Instead, her story goes downhill. She gives birth to her son in a stable, the family flees to Egypt where they live as political refugees, and three decades later she’s there by the cross watching her son die. She is a woman of sorrow, yet despite the sadness she experienced, her song is one of the most beautiful in scripture. Mary realizes her position. She’s a lowly servant of God and any honor she has is due to God’s action within her life. 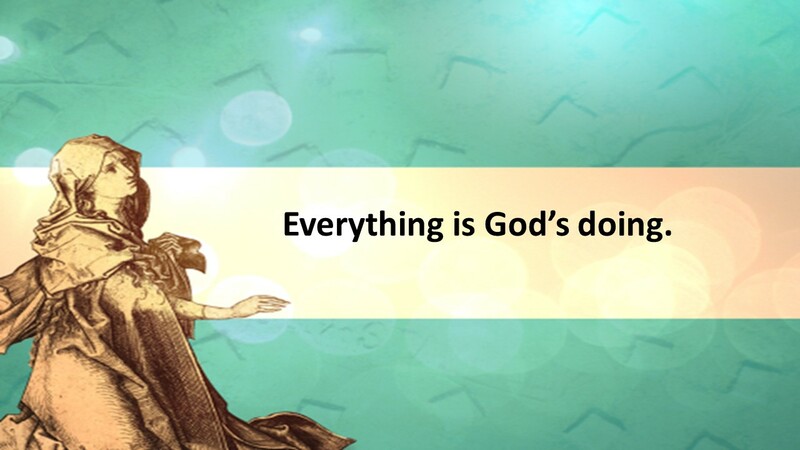 Everything is God’s doing, not hers. She is not the cause of redemption; she’s just a vessel God using to bring the Savior into the world. Mary didn’t go around boasting of her accomplishments and lining up book deals; she isn’t saying, “look at me, I’m the mother of God.” Instead, as Luke tells us at the end of the Christmas narrative, Mary pondered all that had happened in her heart. She’s the model of true humility. As a contemplative, her life was directed toward God who gave her the strength to raise her son. Mary’s song gives us an insight into how God operates. God chose her, an unlikely candidate, to be Jesus’ mother. God lifts up the lowly while pronouncing judgment upon the powerful. Those who are not willing to acknowledge God’s sovereignty are not going to find salvation in Jesus Christ. They’ll be too busy looking out for themselves and pretending their own resources are going to save. They don’t realize the need for a Savior. Mary’s song provides us a model of prayer. If Mary, a woman of sorrow, can sing such a song, why can’t we? In all we do, we need to see how God is working in our lives and then give thanks. We need to take Paul seriously when he says to pray without ceasing. 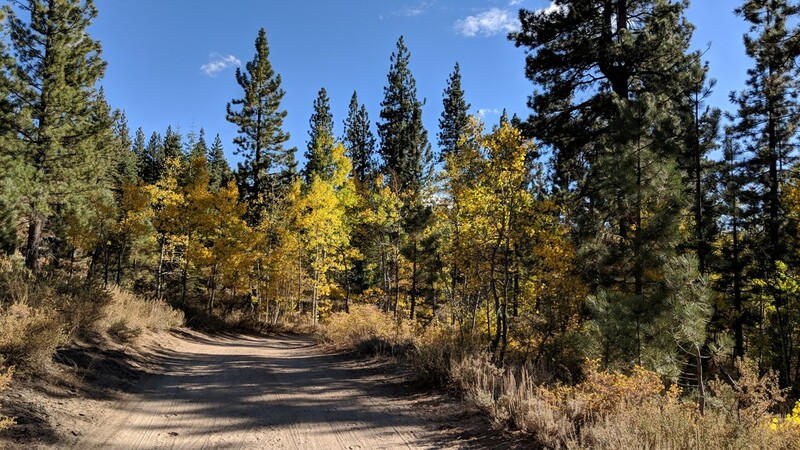 In ages past, contemplatives were often the type of people who gave up everything and moved into the wilderness, but that’s not what this tradition is really about. If, through your prayer life and your study and your quiet time, you are able to connect with God, I encourage you to keep up the good work. However, if the contemplative practice is foreign or difficult for you, that’s okay. There are other ways to connect and respond to God as we will see over the next five weeks. But let’s also take what we can from this tradition. Try praying through the Psalms. 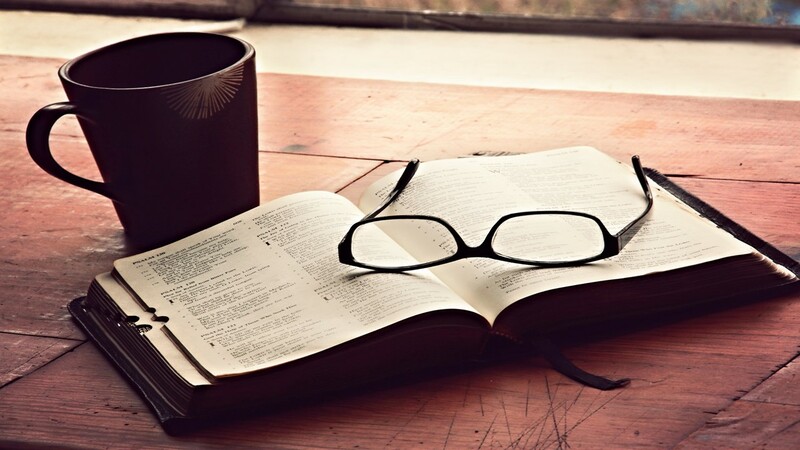 Or practice intentional reading of a passage of Scripture several times, pausing in-between each reading to ask God to open up your mind to his will and then spend a few minutes in silence before returning and rereading the same passage. Do this a few times and see if God is speaking to you through your chosen passage. Or, read devotionals. 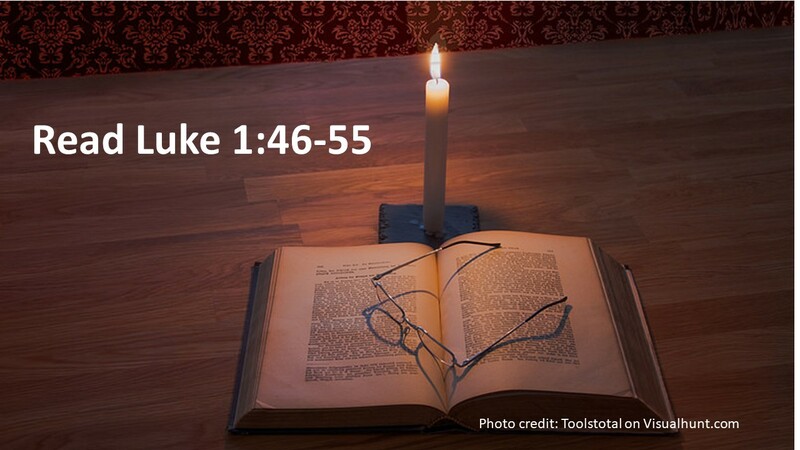 Advent is a good season to make devotional reading a habit. 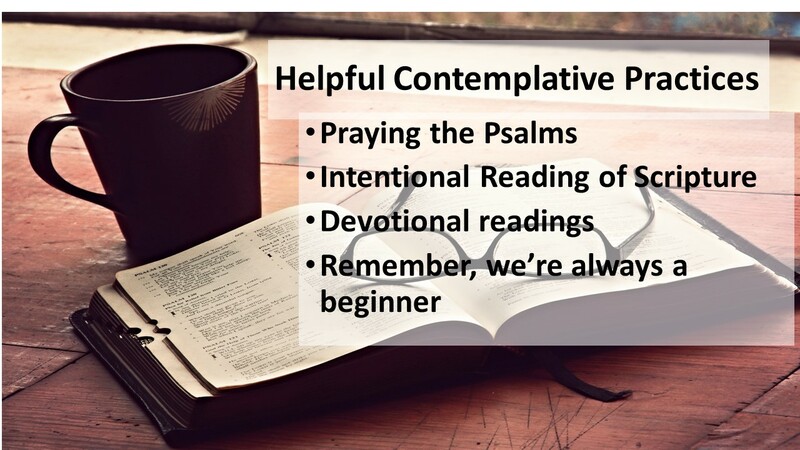 If you’re looking for a good devotional booklet that’s free and online, check out my e-news from yesterday where I had a link to a devotional from the community at Pittsburgh Theological Seminary. In writing about the contemplative life, Thomas Merton, an American mystic, notes how none of us want to be beginners, but we must convinced we will never be anything but a beginner when it comes to this life. But to a true contemplative, that’s okay, because such a person have grounded their being within the life of God. They know it’s not about them, it’s about God. Because Mary was in tuned to God’s action in her life, she was able to serve in a marvelous way. While none of us will have that opportunity, all of us can be of benefit to God’s Kingdom when we open ourselves up to God’s call. Amen. This first part of the sermon was videotaped with the Christmas tree as a background. The video will also be used to promote this season’s sermon series. Richard J. Foster, Streams of Living Water: Celebrating the Great Traditions of the Church, (New York: HarpersCollins, 1998). Peter Hoytema, “Six Biblical Characters, Six Traditions of Faith” Reformed Worship #65 (September 2002). 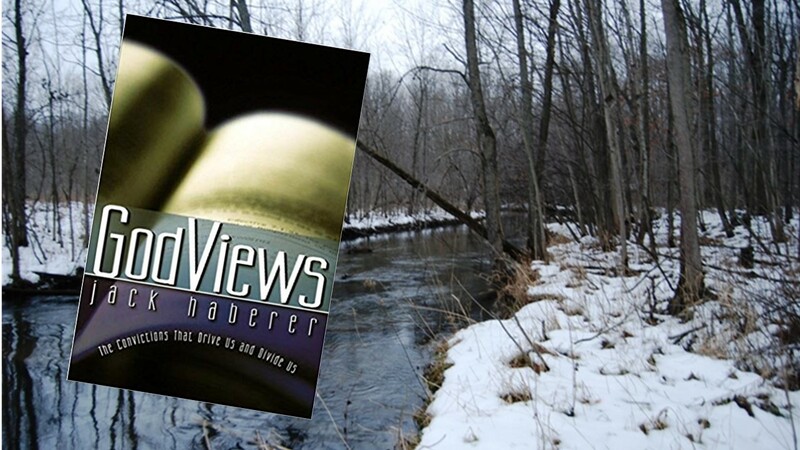 Jack Haberer, GodViews: The Convictions that Drive Us and Divide Us (Louisville, KY: Geneva Press, 2001). Foster also recognizes the dangers of each stream. The contemplative streams has four dangers: 1. Tendency to separate faith from ordinary life, 2.. Asceticism (or focusing too much on God and on pressing social issues), 4. Tendency to devalue intellectual efforts, 4. Tendency to neglect the community of faith. Foster, 53-56. Norval Geldenhuys, The Gospel of Luke, (Grand Rapids: Eerdman, 1982), 85. The six traditions we’ll explore are the contemplative, holiness, social justice, charismatic, incarnational, and evangelical. Thomas Merton, Contemplative Prayer, (Garden City, NY: ?image Book/Doubleday, 1969), 37. I will miss so much my mom is my first Christmas without her.